Sunday Dinners is an intriguingly-designed collection of poems that sing modest hymns to food: the homely qualities of gravy, the surprises in salad, the beans in our coffee. 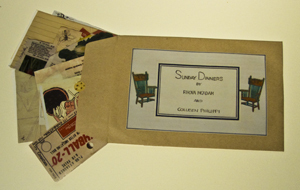 A collaboration between poet Rhona McAdam and artist Colleen Philippi, Sunday Dinners invites the reader to settle down at the table and pull the poems one by one from a plain brown envelope, much as one would uncover the ephemera of family life in a cherished cookbook. 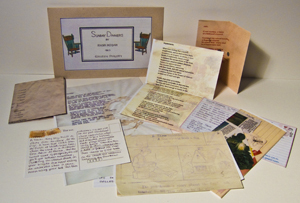 With their odd shapes and textures, the poems are served up on a variety of papers: an exotic postcard here, stained and crumpled scraps of paper there; a much-loved recipe, the label from an old toy; a page from a child’s workbook. Because the poems are unsequenced, they can be explored in any order the reader chooses, or perhaps employed in their turn to mark the pages of another book, to become, as one of the poems suggests: the things/she needs concealed by time/the things she likes to come upon by chance.